How is lightning initiated in thunderclouds? This is difficult to answer - how do you measure electric fields inside large, dangerously charged clouds? It was discovered, more or less by coincidence, that cosmic rays provide suitable probes to measure electric fields within thunderclouds. This surprising finding is published in Physical Review Letters on April 24th. The measurements were performed with the LOFAR radio telescope located in the Netherlands. 'We used to throw away LOFAR measurements taken during thunderstorms. They were too messy.' says astronomer Pim Schellart. 'Well, we didn't actually throw them away of course, we just didn't analyze them.' Schellart, who completed his PhD in March this year at Radboud University in Nijmegen and is supervised by Prof. Heino Falcke, is interested in cosmic rays. These high-energy particles, originating from exploding stars and other astrophysical sources, continuously bombard Earth from space. High in the atmosphere these particles strike atmospheric molecules and create 'showers' of elementary particles. These showers can also be measured from the radio emission that is generated when their constituent particles are deflected by the magnetic field of the Earth. The radio emission also gives information about the original particles. These measurements are routinely conducted with LOFAR at ASTRON in Dwingeloo, but not during thunderstorms. That changed when the data were examined in a collaborative effort with astrophysicist Gia Trinh, Prof. Olaf Scholten from the University of Groningen and lightning expert Ute Ebert from the Centrum Wiskunde & Informatica in Amsterdam. 'We modeled how the electric field in thunderstorms can explain the different measurements. This worked very well. How the radio emission changes gives us a lot of information about the electric fields in thunderstorms. We could even determine the strength of the electric field at a certain height in the cloud.' says Schellart. This field can be as strong as 50 kV/m. This translates into a voltage of hundreds of millions of volts over a distance of multiple kilometers: a thundercloud contains enormous amounts of energy. Lightning is a highly unpredictable natural phenomenon that inflicts damage to infrastructure and claims victims around the world. This new method to measure electric fields in thunderclouds will contribute to a better understanding and ultimately better predictions of lightning activity. Current measurement methods from planes, balloons or little rockets are dangerous and too localized. Most importantly the presence of the measurement equipment influences the measurements. Cosmic rays probe the thunderclouds from top to bottom. Moving at almost the speed of light they provide a near instantaneous 'picture' of the electric fields in the cloud. Moreover, they are created by nature and are freely available. 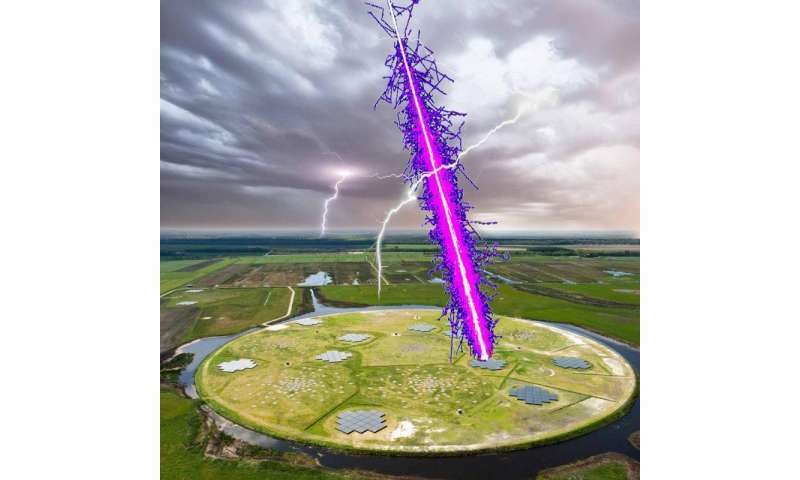 More information: Probing atmospheric electric fields in thunderstorms through radio emission from cosmic-ray induced air showers, P. Schellart et al. Physical Review Letters 24 April 2015.